More than 50% of executives fail within their first 18 months. 1 (Ouch) Regardless of whether failure occurs in a spectacular fashion, or whether it happens slowly and painfully over time, the fallout can be significant. Many businesses think they are doing a good job of onboarding new executives, yet almost 70% of new executive recruits would suggest otherwise. 2 Forced to sink or swim, the performance of executive recruits is being hampered by incomplete or inaccurate information, and an inability to harness the people and resources needed to achieve their objectives. 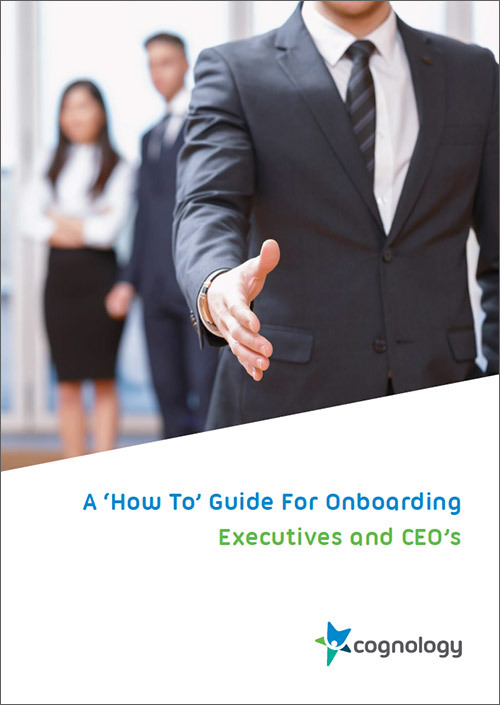 For more information on how to successfully onboard an Executive or CEO, download our whitepaper “A ‘How To’ Guide For Onboarding Executives and CEO’s”. It stands to reason then that when it comes to onboarding, internal and external executive recruits are going to have different needs and priorities. New executives are intelligent and accomplished individuals (otherwise you would not have recruited them, right?). When designing onboarding for this level of employee, you need to make sure the program caters for their advanced needs. Allow the new executive a significant say in their own onboarding plan (these guys like to be in control – it’s in their nature). Be flexible. An employee at this level may feel limited by a set agenda or become frustrated by a programme that doesn’t keep pace with their needs. Provide ample opportunities for them to network with people with shared interests or unique expertise to accelerate their learning. Consider whether a handover period with the previous incumbent would be beneficial. Pitch content at the right level – more headlines, less detail. There should be a bias towards developing the new executive’s strategic understanding of the business before anything else. There is constant pressure on new executives to make changes, solve problems and deliver immediate results – particularly when a business is not doing so well. This often results in a temptation to rush through onboarding or take shortcuts so that the executive can ‘get to work’. But such haste is perhaps the reason for the dismal executive failure rates. Insufficient onboarding will result in a leader’s understanding of company culture, goals and operations being incomplete or inaccurate. Onboarding is about giving a new executive foundation for long term success, not for a quick fix. Smith, Jacquelyn. “Why Half of All New Executives Fail Can Be Narrowed down to 4 Reasons.” Business Insider Australia. 02 Mar. 2015. Triantogiannis, Mark Byford Michael D. Watkins Lena, and Harvard Business Review. “New Leaders Need More Than Onboarding.” Harvard Business Review. 18 July 2017. Martin, Jean. “For Senior Leaders, Fit Matters More than Skill.” Harvard Business Review. 01 Nov. 2014.